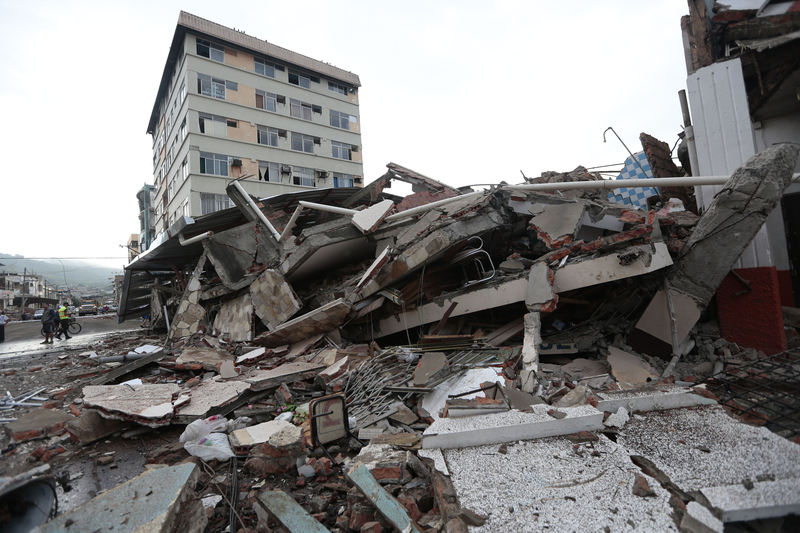 Disaster struck on Saturday on the central coast of Ecuador when an earthquake left more than 230 dead and hundreds more injured. The epicenter of the 7.8 magnitude quake struck about 16 miles inland from the famous Ensenada de Mompiche, one of the country's top tourism spots. Neighboring countries Peru and Colombia, hundreds of miles away from the center, could feel the effects as well. Ecuadorian President Rafael Correa cut short a planned state trip to Europe to return home and declare a national state of emergency. "The official death toll has risen over 233," said President Correa in a series of tweets. "Immediate priority is rescuing from the rubble. We will facilitate foreign aid workers ... Thank you to the world for your solidarity." Some of the areas most heavily affected were the coastal region near the epicenter, as well as the cities of Guayaquil, located over 300 miles away from the epicenter, and Pedernales, about 100 miles from the epicenter. In Guayaquil, the country's most populous city, a bridge collapse on a major street killed at least one person and trapped several others. Many of the 40,000 residents in Pedernales, a northern coastal town near the epicenter, slept on the streets or worked through to help those trapped under rubble. "We're trying to do the most we can, but there's almost nothing we can do," said Gabriel Alcivar, mayor of Pedernales. Emergency response is already underway as the Ecuadorian government mobilized military forces to assist citizens and rescuers. Vice President Jorge Glas told reporters that over 10,000 armed forces had been deployed to help, and 4,600 additional police were dispatched to areas near the epicenter to facilitate recovery efforts. Additionally, shelters and field hospitals have been set up in the cities of Pedernales and Portoviejo, and more than 3,000 packages of food and nearly 8,000 sleeping kits are being delivered for many Ecuadorians who now find themselves homeless. According to the U.S. Geological Service, this most recent quake is not related to the earthquakes that hit Japan late last week. Although both countries are located on the "Ring of Fire," a seismically active area in the Pacific Ocean, they were separated by too much distance to have any reasonable connection. "Even the earth's rocky crust is not rigid enough to transfer stress efficiently over thousands of miles," the USGS posted on its website. The Pacific Tsunami Warning Center stated that the risk of a tsunami has now passed, meaning the Ecuadorians are likely out of new danger. Now, rebuilding efforts will take precedent as the Ecuadorian government and citizens work to stabilize their country again.